We caught up with professional cyclist Tiffany Cromwell, a yearly participant in the COCC ride to get the lowdown on how she got into cycling, why she takes part in the COCC ride, what goes on during the event and her advice for future cycling enthusiasts. Read all in our Q&A below. COCC 2019 - pre, during and post ride. Hello to all COCC 2019 riders! We’ve put together this blog to give you some great hints and tips to make your 2019 ride the best it can possibly be! Graham, a member of the squad since the pre-COCC days came to talk to us about his how he got involved and why it means so much to him and to share some very useful information about the stops along the way. What is your involvement with COCC? Initially I was here for the first ride which was actually only 7 people and it went from here to Saint Tropez and we took them all back in the cars and that was through McLaren Construction. It wasn’t a COCC ride, but it was a ride done with Terry Torrinson and all the other lads such as Kevin Taylor of McLaren construction. From that came COCC 4 months later, a ride from St Tropez to Monaco. That’s when I got involved. I was asked to fly over from the UK and drive the car to support the riders. From then on I’ve done every single one of the rides (accept from one) as the support driver. So what happens before the ride from a technical point of view? On the Saturday morning we go to the Monaco digue, and we collect all of the bikes from those that want their bikes transported to St Tropez. 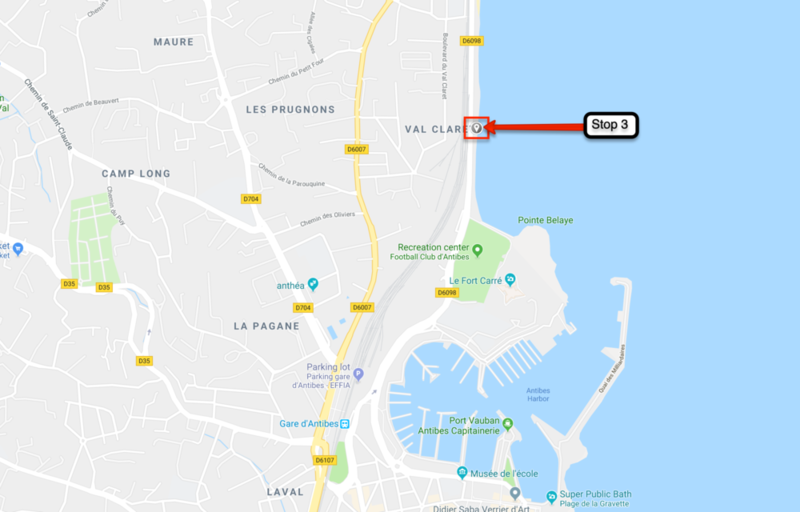 That takes place from around 9/9.30am, we give them until around 11/11.30am to get their bikes to us and then we take the bikes down to St Tropez where most people come and collect them on the same day (Saturday) around 4.30/5.30pm at the car park of Hotel Sube which is the hotel just above the Café de Paros. We also transport all the drinks and energy bars supplied by Simon Gook from #1 and any other bars and snacks people bring along. We’re then back in the car park around 5.30am, at which point some of us aren’t in the best of states because the Saturday in St Tropez is also a night for everyone to enjoy. We’re there to make sure everyone has all that they need for the ride. The cycling club of Monaco is also there to provide technical support for anything that goes wrong with people’s bikes. They’re also there all the way through the ride and sit in the lead van with me. Former pro-cyclist Juilen Camellini owner Camellini Cycling in Beaulieu-Sur-Mer, supports the riders along with Monaco Cycling Club who are our contacts on the bikes for any mishaps, accidents or mechanical failures and all riders will have a GPS of some sort. All they need to do is contact us with which kilometre they’re at and we will know where to pick them up. Steve Stanway is in the last van following the riders and everyone knows who he is because he introduces himself at the car park in St Tropez before the ride. Stop one is seen as the most important as it gives the cyclists the supplements needed before hitting the Esterels which is the most challenging part of the route. The second stop is just outside the Pullman hotel in Cannes Mandelieu, in the same place as last year. We’re going to be just outside, near the Ermitage (not Hermitage). Here the riders will be able to eat some food, usually some sandwiches, croissants, pain-au-chocolates and of course Snickers and Mars bars. The third stop is outside the Hippodrome, just after Antibes Castle. We’re always on the beach side of the road. This is our last stop that we help the riders with, and then their next stop is Ma Nolan’s in Nice. Once the last rider gets to Ma Nolan’s, that’s when Steve Stanway’s van gets there, and that’s the point when we ask the cyclists to head off as one. This is because when they get to Cap d’Ail they’ll be met by the police who will chaperone them into Monaco. 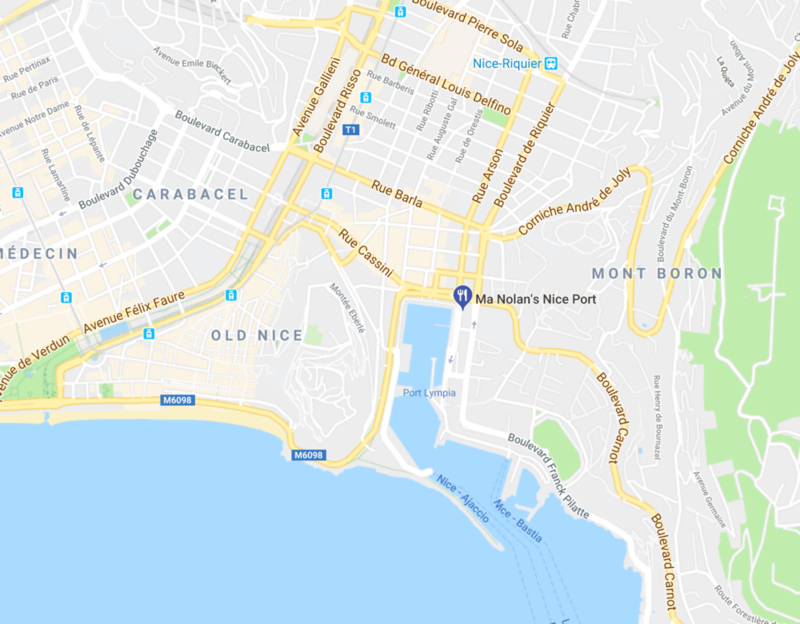 The roster point will be by the Lamborghini Monaco garage at which point everyone will make their way towards the finish line at Stars & Bars in Monaco. 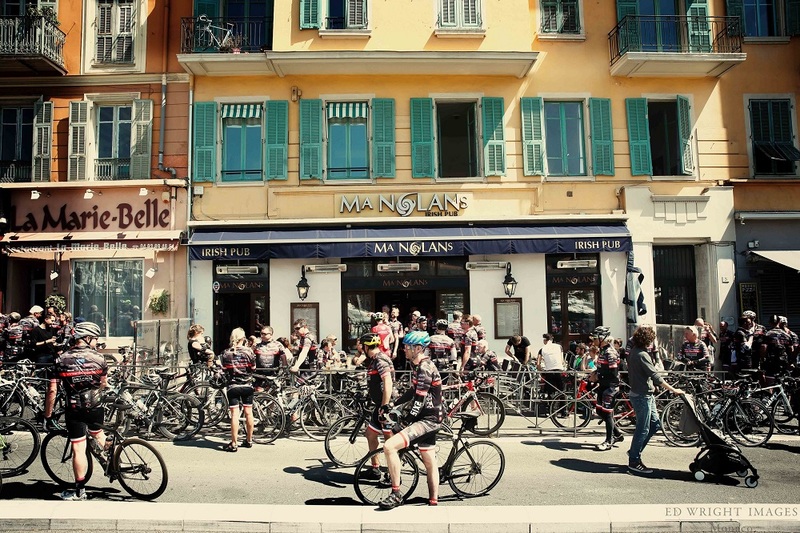 The riders are met by a huge welcome from family and friends at Stars’N’Bars in Monaco which is always a nice thing to see, they then get to tuck into some tasty oysters and nice chilled champagne. After Stars’n’Bars we head to Slammers and then the party really gets going. Food, drink, live music and the general frivolities of Slammers, of which I think everyone’s aware of. It’s great fun, and tickets are available behind the bar in Slammers. There are also the AWARDS! There’s a gold peddle, silver peddle and a bronze peddle… and also the anorak is handed out as well. The anorak is for someone that takes it a little bit too seriously. *someone* usually wins this award. How would you describe COCC? It’s an amazing thing. It’s grown into a community. It’s great for people to get involved if they’re new in the area to meet some people and has such great health benefits. One lad spoke volumes on how being a member of COCC has really helped him to get fit and stay fit, so along with helping the HRH Princess Charlene of Monaco Foundation with their fight for the education of water safety, it’s helping the local community with their health and well-being too. The website for making donations has now been set up. Anyone wishing to set up a personal donations page should click JOIN THIS GROUP on the page and follow the simple instructions. Vans will be on the Digue in the Port (Cruise Ship coach park) from 09.00 – 11.00 on Saturday to pick up the bikes. Anyone wanting their bike transporting to St. Tropez needs to deliver it to the collection point in good time. We take no responsibility for any damage to bikes. 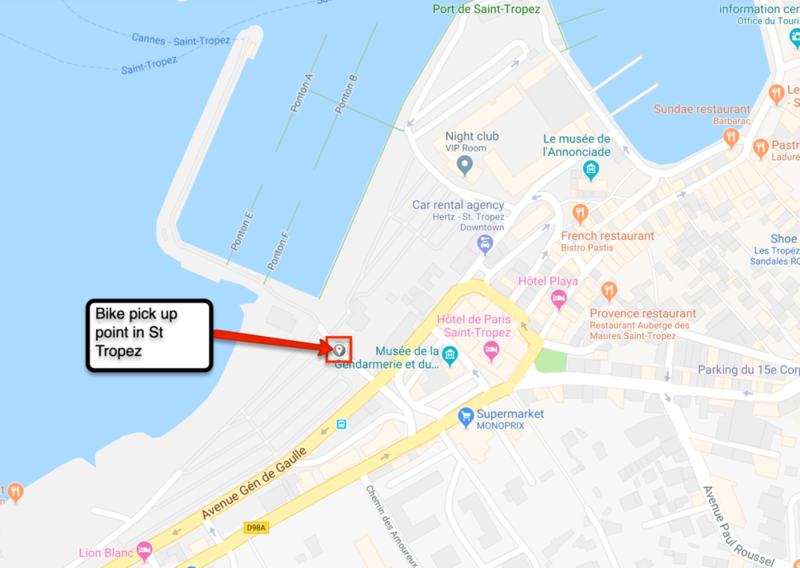 Bikes can be collected in the car park on the Port in St Tropez from 17.00 – 17.45 on Saturday and 07.00 – 07.30 on Sunday. Small bags can be transported back from St Tropez in the vans and should be dropped off on Sunday Morning. Note: It is your responsibility to collect your own luggage promptly on arrival at Stars N Bars as we need to return the vans. There will be a snack lunch provided at one of the stops on the Sunday - anyone with specific dietary requirements will need to provide their own. Anyone who has not yet had their forms signed by their doctor needs to do so before they collect their kit; otherwise they will not be covered by the Monaco Cycle Club insurance and will be responsible for all risks and injury to themselves and any third parties. This insurance is covered in your € 1,000 minimum commitment but is only valid if the forms are correctly completed. If in doubt please give me a call or email me next week. Just another reminder that we are finalising this years kit order this week and need your application forms to be submitted with kit size ASAP. If you have not been able to complete the medical forms these can be submitted closer to the time, however if you are applying for an annual cycling licence this will only be issued once the medical forms are completed and will run until end 2019. I have been advised that some people have had problems sending the forms to the info@coccmonaco.com address. This years kit order will need to be placed by the end of next week. Please send your application forms with size details ASAP.